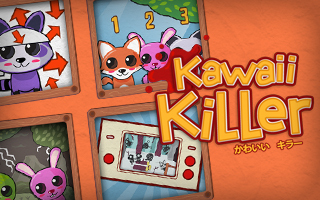 « Kawaii Killer : Collectionnez-les tous ! Hello courageous gamer! Did you beat every score in arcade mode? Have you seen the 3 different endings? Did you got all the badges and found the ultimate combination? Did you explode the speedrun best time? Then the challenges are for you! They are of all sorts! Test your memory in the eponym challenge, and memorise the order in which you have to kill the animals. Transform into an owl for the Thunderstruck challenge, in which you can see the animals only when thunder strikes. 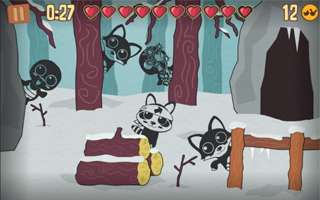 You can also exercise your skills in the Shadow Hunter challenge, where all animals are only shadows and therefore hard to recognize, or try to survive the Raccoon fury challenge, in which the arrow on the raccoon’s heads is in perpetual motion. And if you’re a nostalgic, the Game & Clock challenge will remind you of the good old games you had a long time ago. 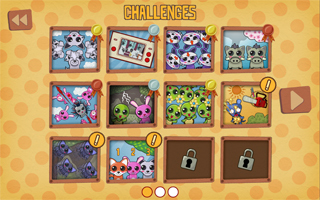 36 challenges with original rules are unlockable. Just exercise your reflexes and try to get the gold medal in every challenge!